Founded by Chris Kniker of Lords of Acid and funded by a crowd-sourced campaign, Primitive Race is a prototypical industrial supergroup. The “featuring” list is extensive, carrying contributions from members of Skinny Puppy, Danzig, Combichrist, Nine Inch Nails and more, and thus one expects what any experienced music listener expects from an over-saturation of talent. Supergroups have a tendency to suffer from having ‘too many cooks in the kitchen,’ and with so many egos thirsting for control amidst clashing touring schedules, albums can end up rushed and confused. The nuances of role balance in a band can take years to form, so throwing together a mix of seasoned musicians is a risky recipe that can pay off big or end up flopping. Does Primitive Race transcend these expected pitfalls, or fall flat on its face? “So Strange” opens the album with a polished modern industrial architecture. There isn’t anything too risky here, but if there is one thing that Primitive Race is successful at, it is the delivery of crisp, genre-typical rhythmic composition throughout the album. The producers are seasoned and know how to deliver what industrial fans are looking for. The sonic textures expand as the album stretches on, drawing from the well of classic industrial music with foundational gestures reminiscent of earlier Nine Inch Nails albums such as Pretty Hate Machine, mixed with some Depeche Mode synths and imitation Marilyn Manson vocals. “Cage Rattler” tastefully tosses in some blues to the mix which is interesting, and “Taking Things Back” brings a somewhat reviving atmosphere and some well-placed chromaticism to enhance the compositional depth of the music. Unfortunately, the production doesn’t have the power to overshadow the feeling of lyrical immaturity that is pervasive on Primitive Race. “Follow the Leader,” the apparent defining vessel of Primitive Race’s underlying purpose (according to Kniker), reeks of adolescent disgust aimed at a nameless mass of followers who have no self direction. The vision seems childish, the philosophy shortsighted, and the artistry unrefined. “DJFH” criticizes radio DJs and the music industry at large with a humorous upbeat sound, but it comes across as petty. “Acceptance of Reality” is critical of those who over-analyze situations and criticize other people, which is deeply hypocritical in the lyrical context of the rest of the album and exposes the lack of tenacity beneath it all. Supergroups, however promising as they may seem, are hard to pull off, and this truth is on full display in this debut. 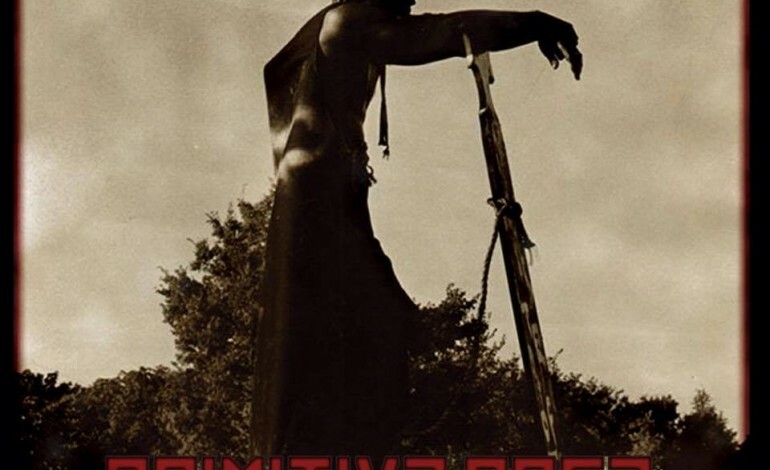 Primitive Race is an okay listen for fans of a traditional industrial sound with some modern bells and whistles added on. The industrial groove is solid throughout, but the childishness of the lyrics showcased on such tracks as “Give Up the Ghost,” (which has no melody or song structure), and “Platinum Balls,” (which is literally referring to testicles), is too graceless to overlook. Pair this with the quality of the vocal performance/production, which feels as if it was run through a vocal chain that deserves a little more compression and de-essing and a little less digital tape delay, and you’ve got a recipe for a cringe-tastic listen that simply feels uninspired and rushed out.